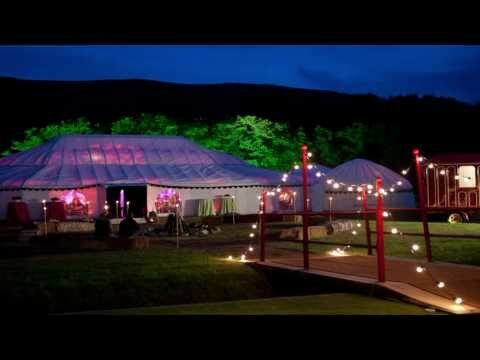 Amazing Yurts for the Home, for work and away. Beautiful, adaptable and freestanding, these structures are easily erected and transported. They have no guy ropes or central pole and create a perfect open space for accommodation, recreation or work. LPM Bohemia yurts are crafted in the UK with best British materials to a variety of traditional and contemporary yurt designs. Thought to originate from central Asia and becoming synomomous with the Mongolian steppes the yurt or Ger has become indigenous to a number of countries as far West as Turkey and with variations in design that have evolved over some 3,000 years. Any design that has evolved over such a long period is hard to beat. Light weight and portable for a nomadic lifestyle (a useful prerequisite for a movable tent) it is also robust, providing permanent shelter in some of the harshest environments. These vary in the manufacture of yurts worldwide usually driven by both function, availability and environment. At LPM Bohemia we use a good renewable source of English oak and Ash from Sussex and Kent is ideal for the frame work and these are treated with oils to help ensure that they should last a life time. Originally felt made from wool was an ideal resource for the nomadic shepherds of the steppes and can still be used today to provide further insulation for your yurt. 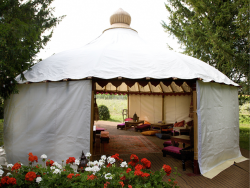 Different fabrics suit different uses but a treated Waxed cotton canvas forms an ideal outer skin for a yurt in Europe, combining a breathable and traditional feel with modern techniques of fire, water and mildew prevention. Standard sizes range from between 10’ to 30’ in diameter but we can also manufacture more bespoke sizes and designs. Choices and extras can also include Windows, canvas colour, decking, wood burning stoves, hot tubs, composting toilets and we are happy to discuss all of these options with you. How long should my yurt last? The wooden frame should last indefinitely if looked after – made from solid hardwoods it should only improve with age. The life of the cover will depend on the materials chosen and how long the yurt is left up at one time. Careful storage and treatment will ensure a longer life – please ask for advice. How long does a yurt take to erect? With a little practice a 20’ diameter yurt can be erected by 2 people in under one hour although it is likely to take a little longer the first time. Can I join yurts together? Yes interconnecting yurts works really well to provide bedrooms off a larger more communal space or even an en-suite bathroom. How portable is a yurt? If your yurt is changing location frequently a ground sheet with tailored carpet on top may surfice but for a beautiful finish you cant beat a wooden floor or deck. We can provide a full deck for your yurt – may we also recommend a slightly larger decked area from which to watch the sun go down from your rocking chair. Please feel free to call with any questions you may have no matter how small.